1. Start by boiling the kettle and placing the paella rice in a pan. Cover the rice in boiling water and simmer on a low heat for around 10-15 minutes, don't let the water dry out and every so often give it a stir. 2. Heat the paella pan up on the hob with a generous splash of olive oil in. Whilst that heats up, chop the onion into small diced pieces. Then add the onion to the hot pan to lightly brown. 3. Prepare the chicken, chop into small cubes and place into the pan, cook through until white juices run from the chicken and no pink bits are to be seen. 4. 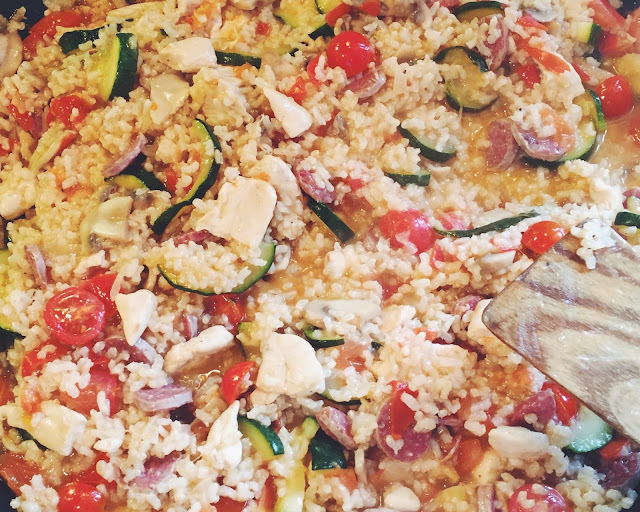 Chop up the courgette, tomato and mushrooms and add to the pan. Make sure to include all the juice from the tomato after having cut it up. Allow the veg to cook and soften for a few minutes. 5. Chop up the chorizo sausage into small chunks and add to the pan. 6. After a few more minutes of allowing the veg, chicken & chorizo to simmer, add in the paella rice along with some water, if you have a lid big enough, cover the pan for a few minutes. This will allow all the water to be soaked up and all the flavours to fuse together and create something really delicious and tasty. After about 5-7 minutes, lift the lid and give it a good stir, if you think you need to add more water or olive oil, do so now and allow to simmer on a low heat for a further 2 minutes. Once all cooked through together, add salt & pepper for seasoning, chop up some cherry tomatoes and throw on top. Serve up in the paella dish with a side salad or simply on its own. Hope you love this paella dish as much as both myself and my friend did. We made plenty so we could eat it for left-over lunches too!